The carefully chosen ingredients and essential oils ensure that this mildsoap revitalizes, activates, nourishes and calms etc. The rich scent makes the experience even more pleasurable. 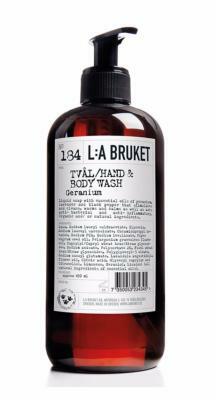 Highly moisturizing liquid hand and body wash. The essential oils of Geranium, Lavender and Black pepper stimulates and cleans, warms and soothes as well as acts antibacterial and anti-inflammatory.